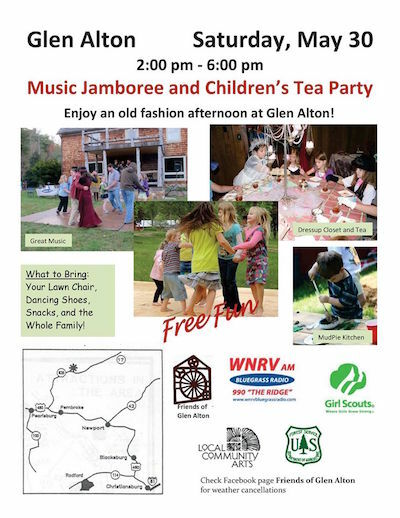 The 2015 Glen Alton Spring Jamboree & Children’s Tea Party will be held at the Glen Alton Recreation Area from 2-6 PM on Saturday May 30, 2015. WNRV will be on-site recording the music for use in future shows. The festivities will include several sets of live music, a square dance, children's tea party, children's dress up, demonstrations, and more. Steve Kruger and Mac Traynham will provide plenty of great tunes starting at 2 PM and Ginger Wagner will call the square dance at 4 PM. The beautiful Glen Alton area includes mountain views, wetlands, rivers, ponds, and streams, as well as a historic lodge, barns and caretaker's house. It is located off Big Stony Creek Road (SR 635) near White Rocks Campground between Pearisburg and Pembroke, VA.